Posted on March 8, 2017 , in Treadmill. If you’re thinking about investing in a treadmill so you can get a good workout in when it isn’t nice enough to walk outdoors, you might be concerned about whether walking on a treadmill can give you a good workout. Below, you’ll learn about the major benefits you can experience by walking on a treadmill for just 30 minutes per day. Regular walking is known to modulate your nervous system, making you less likely to get angry. If you walk with a friend or partner, the social interaction can boost your mood even more. Walking at a higher intensity can even boost neurotransmitters and endorphin in your brain, which can fight pain and depression. If you’re feeling uncreative or having difficulty solving a difficult problem in your life, walking can help. Tests that measure creative thinking while walking have found that walkers were able to come up with more creative solutions than subjects who did the tests while sitting in a chair. Many people overlook the fact that walking is a great way to lose weight. In fact, walking can raise your metabolism and prevent muscle loss, both of which will keep you burning more calories even when you’re resting or going about everyday activities. If belly fat is an issue for you, walking on a treadmill is a great exercise option as it is known to improve the insulin response and diminish fat in your midsection. Even walking one mile per day can help you lose weight and gain muscle. From diabetes and blood pressure to cardiovascular disease, walking has been found to reduce the risk of many chronic diseases. Walking on a treadmill for 30 minutes per day can reduce the risk of stroke by up to 40% and cardiovascular disease by 30%. Not only will walking on your treadmill keep your legs toned, but it reduces your likelihood of developing varicose veins. Walking tones leg muscles and improves circulation in the muscles, veins, and valves in the calves and feet, keeping varicose veins at bay. 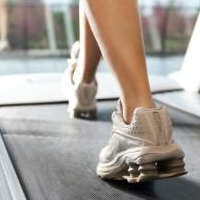 If you already have varicose veins, walking on a treadmill can reduce swelling and pain. Even those who are genetically more likely to suffer from varicose or spider veins can benefit from walking as it can reduce their onset. When you start walking regularly and establish a routine, you become more likely to not only continue that routine, but to develop other more healthy behaviors. Walking and achieving your goals each day will also help you stay motivated to reach goals in other areas of your life. Now that you know more about how walking on a treadmill can benefit you, download this month’s promotion and save on a variety of fitness equipment.